As the Hubble Space Telescope starts to enter old age, a new report offers one exciting vision for a space telescope that could come online by the early 2030s. Known as the High Definition Space Telescope, or HDST, it would sit a million miles from Earth, its 54 individual mirrors combining to form a surface with 25 times that of Hubble—enough muscle to search scores of Earthlike exoplanets for signs of life, lay bare secrets of the birth of galaxies like the Milky Way, and study our own solar system in astonishing detail. It would also make images so stunningly sharp they’d far outshine Hubble’s own eye-popping photographs. Hubble still has a few good years left for major discoveries. And its successor, the James Webb Space Telescope, will begin scanning the skies in 2018. But astronomers know it’s not too soon to be thinking about what might come after that. It’s understandable that Postman and his colleagues would jump at the chance to think boldly. Astronomers have learned by experience that every major leap in telescope power leads to discoveries no one could even have predicted beforehand. Hubble’s 1995 discovery of billions of galaxies at the edge of the visible universe is just one headline-making example. To spot a potentially life-bearing twin of Earth, a telescope not only has to see an extremely faint planet, but it also has to resolve, or separate, the planet from nearby stars. Those images tend to merge with the Hubble or James Webb telescopes, just as the headlights of a car approaching from many miles away look like a single spot of light. The bigger the mirror, the higher the resolution—especially in space, where there’s no atmosphere to blur the image. 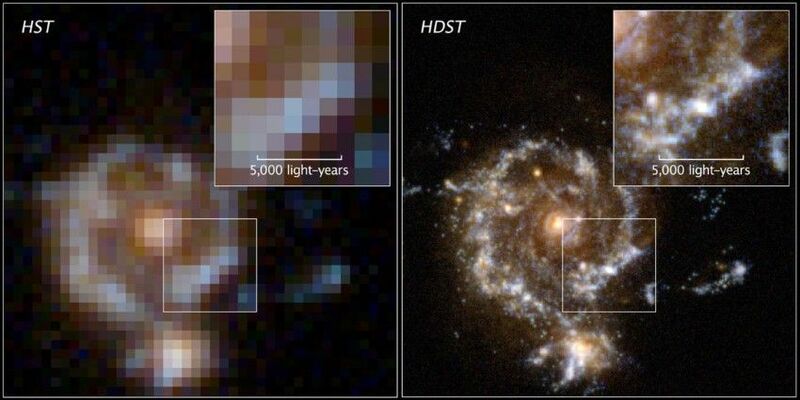 HDST would also be “awesome for resolving things in the outer solar system,” says Heidi Hammel, an astronomer with Associated Universities for Research In Astronomy (AURA), which commissioned the report. Hammel wasn’t involved in the report. Closer to home, the new telescope could take repeated images of the atmospheres of Uranus and Neptune, for which we only have snapshots from Voyager 2. It could also look at several of Pluto’s cousins in the outer solar system’s frozen Kuiper Belt, which was discovered only in the past decade or so. “Every large Kuiper Belt object, including Eris, Haumea, Makemake and Quaoar would all be resolvable,” says Hammel. The authors of the HDST report say they’re well aware of the issue. Much of the Webb’s cost overrun, they say, came from the need to develop brand-new technologies, many of which can be carried over to the new scope. The Webb, moreover, was designed to operate at much lower temperatures than HDST, so its components all had to be tested in cold rooms. That won’t be necessary for the new telescope.